Akin to my wardrobe, my skincare and my makeup, I love changing my fragrance as we move through the seasons. I used to be 100% loyal to one perfume in particular and whilst I'd still refer to it as my signature scent, fragrance is all too big of a beauty category for me to just wear one and finding a new favourite is always such a pleasure. 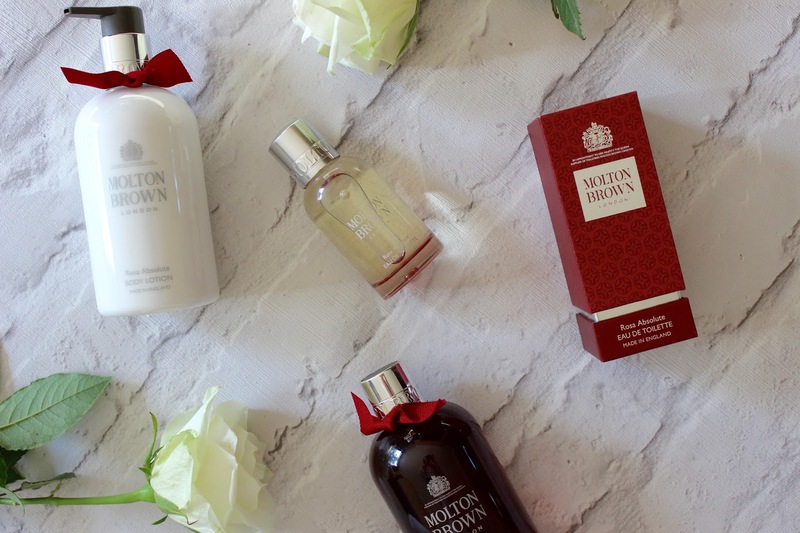 Enter one of Molton Brown's latest collections, Rosa Absolute, which is my go-to choice for autumn and winter. Firstly, would you just look at that packaging. Could it look any more festive and downright gorgeous? Everything from the decadent tinted glass to the ruby-red ribbons tied around the bottles shouts 'wrap me up and put me under the tree for someone special' to the point where simply looking at the products makes me excited for Christmas. I feel like Molton Brown is such an excellent choice for gift-giving as there's something for everyone, and their sets are really something special. Onto the fragrance itself, Molton Brown invited myself and a truly lovely group of bloggers to discover Rosa Absolute at Bocca Di Lupo in Soho where we had such a nice evening of amazing pasta, great chats and a lot of sniffing as we were taken through the Rosa Absolute scent in detail, individually smelling each component of the fragrance before the scent was unveiled in its entirety. It's the most stunning bouquet of berries, rose and patchouli and it blew my socks off, put simply! Molton Brown set the scene behind the inspiration for the fragrance: "A private dressing chamber, draped in the deepest darkest ruby. Hushed, dark whispers unmasked sub rosa. The theatre of nightfall, a promise full of mystery. Devote your senses to an intoxicating secret. Voluptuous. Dramatic. Impassioned." I'd really recommend checking out their Behind The Blend page, as it tells the story of the scent perfectly and is so visually pleasing also! It really is a very opulent and captivating scent, one that I personally think is perfect for the colder months and I can't think of anything better than spraying my scarf with the Rosa Absolute Eau De Toilette and heading out into the crisp air, letting the fragrance develop throughout the day and breathing it in whenever I need a moment of calm. If you immediately think 'granny' when you hear rose then you'll be pleasantly surprised by this as it's a nice modern take on rose that's fresh as well as prettily sweet and deliciously spicy. I also have the Rosa Absolute Bath & Shower Gel and the Rosa Absolute Body Lotion which I love just as much as the perfume, and various gift sets are also available. I'll definitely be purchasing some for the ladies in my family and in Will's, as on more than one occasion I've whipped the perfume out of my bag for someone to have a smell and so far, I haven't had a single person do anything except let out a big sigh and say either "wow", "oh my gosh" or "oooooh!" The proof's in the pudding, guys.